"The fact that this is happening so early in the history of the universe poses a formidable challenge to our present-day understanding of the way structures form in the universe," said Scott Chapman, an astrophysicist at Dalhousie University in Halifax, Canada. "How this assembly of galaxies got so big so fast is a bit of a mystery, it wasn't built up gradually over billions of years, as astronomers might expect," said Tim Miller, a doctoral candidate at Yale University and coauthor on the paper. "This discovery provides an incredible opportunity to study how galaxy clusters and their massive galaxies came together in these extreme environments." Peering deep into space—an astounding 90 percent of the way across the observable universe—astronomers have witnessed the beginnings of a gargantuan cosmic pileup, the impending collision of 14 young, starbursting galaxies. This ancient megamerger is destined to evolve into one of the most massive structures in the known universe: a cluster of galaxies, gravitationally bound by dark matter and swimming in a sea of hot, ionized gas. 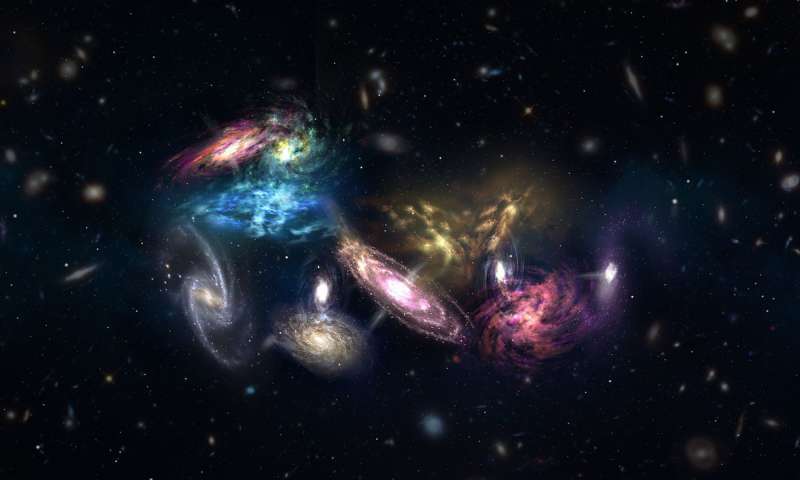 Using the Atacama Large Millimeter/submillimeter Array (ALMA), an international team of scientists has uncovered a startlingly dense concentration of 14 galaxies that are poised to merge, forming the core of what will eventually become a colossal galaxy cluster. This tightly bound galactic smashup, known as a protocluster, is located approximately 12.4 billion light-years away, meaning its light started traveling to us when the universe was only 1.4 billion years old, or about a tenth of its present age. Its individual galaxies are forming stars as much as 1,000 times faster than our home galaxy and are crammed inside a region of space only about three times the size of the Milky Way. The resulting galaxy cluster will eventually rival some of the most massive clusters we see in the universe today. "Having caught a massive galaxy cluster in throes of formation is spectacular in and of itself," said Chapman who specializes in observational cosmology and studies the origins of structure in the universe and the evolution of galaxies. During the first few million years of cosmic history, normal matter and dark matter began to aggregate into larger and larger concentrations, eventually giving rise to galaxy clusters, the largest objects in the known universe. With masses comparable to a million billion suns, clusters may contain as many as a thousand galaxies, vast amounts of dark matter, gargantuan black holes, and X-ray emitting gas that reaches temperatures of over a million degrees. Current theory and computer models suggest that protoclusters as massive as the one observed by ALMA, however, should have taken much longer to evolve. This particular galactic protocluster, designated SPT2349-56, was first observed as a faint smudge of millimeter-wavelength light in 2010 with the National Science Foundation's South Pole Telescope. Follow-up observations with the Atacama Pathfinder Experiment (APEX) telescope helped confirm that it was in fact an extremely distant galactic source and worthy of follow-up observations with ALMA. ALMA's superior resolution and sensitivity allowed astronomers to distinguish no fewer than 14 individual objects in a shockingly small region of space, confirming the object was the archetypical example of a protocluster in a very early stage of development. 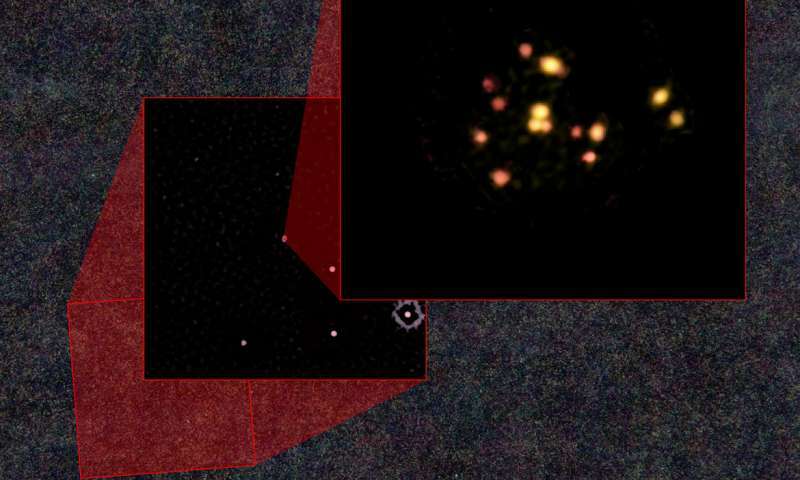 This cluster's extreme distance and clearly defined components offer astronomers an unprecedented opportunity to study some of the first steps of cluster formation less than 1.5 billion years after the Big Bang. By using the ALMA data as the starting conditions for sophisticated computer simulations, the researchers were able to demonstrate how this current collection of galaxies will likely grow and evolve over billions of years. 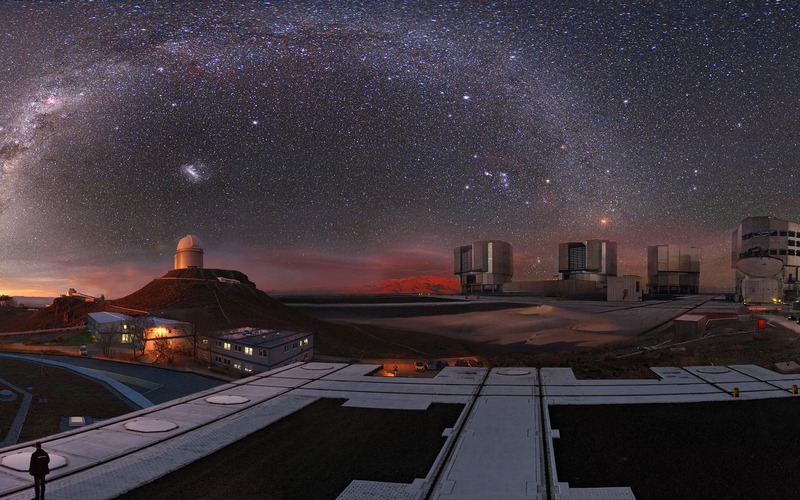 "ALMA gave us, for the first time, a clear starting point to predict the evolution of a galaxy cluster. Over time, the 14 galaxies we observed will stop forming stars and will collide and coalesce into a single gigantic galaxy," said Chapman. This research is presented in a paper titled "A massive core for a cluster of galaxies at a redshift of 4.3," by T.B. Miller, et al., which appears in the journal Nature.